Air France has agreed to replace within days sensors on all of its Airbus A330 and A340 airplanes, parts that are suspected of being involved in last week’s crash, a pilots’ union said Tuesday. The part of the ocean where the debris and bodies have been found ranges from 6,000 to 8,000 meters (about 19,700 to 26,250 feet) deep. The search area covers 200,000 square kilometers (77,220 square miles), an area nearly as big as the country of Romania. Watch CNN’s Karl Penhaul report on more bodies found » Brazilian officials emphasized Monday that finding bodies was their priority. The French are in charge of finding the black boxes, and a submarine was en route as part of that mission. Fourteen aircraft — 12 Brazilian and two French — were participating, along with five Brazilian ships and one French frigate. In Washington, a U.S. defense official said the U.S. Navy will contribute two high-tech acoustic devices to listen for emergency beacons still operating in deep water. The “towed pinger locators,” which help search for emergency beacons on downed aircraft to a maximum depth of 20,000 feet, will be placed aboard two French tugs that are part of the search efforts, the official said. Recovery of bodies and debris is significant not only for families but also for crash investigators, Schiavo said. “Even if they don’t find anything else, they can get some very important clues from the pieces that they do find and from the human remains,” she said Saturday. Watch an explanation of what could have caused the crash » She said investigators would be able to tell whether there was an explosion from possible residue on the bodies or other items. 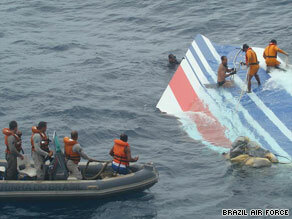 Or, if water is found in the lungs of victims, investigators would know that the plane went down intact, she said. Scientology on Trial in France: Can a Religion Be Banned?